Syria Gives Up Chemical Weapons ... But A War Rages On : Parallels Syria appears likely to meet Sunday's deadline for handing over its chemical arsenal. But President Bashar Assad hasn't been weakened. His forces currently have the upper hand in the civil war. 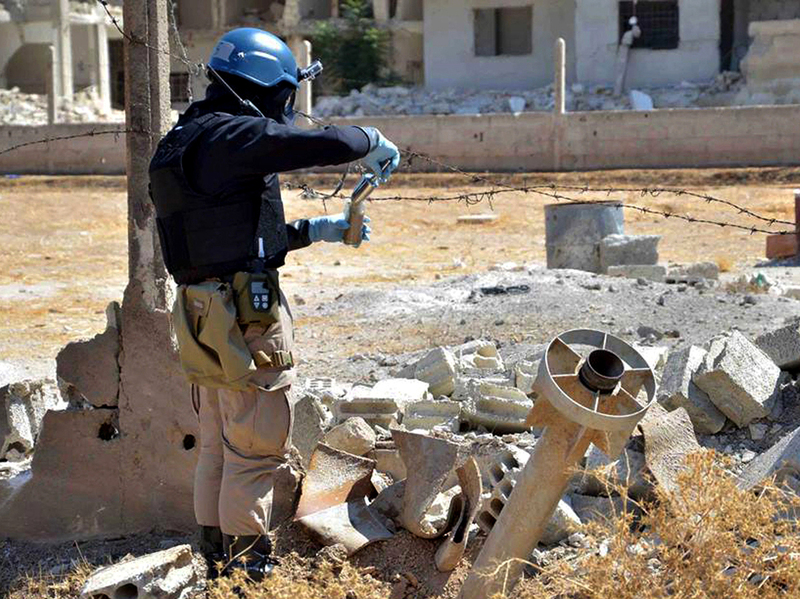 A member of a U.N. investigation team collects samples of sand near part of a missile used in the deadly chemical attacks on Ghouta, on Aug. 28, 2013. Sunday is the deadline for Syrian President Bashar Assad to hand over his government's chemical weapons stockpile, and he will have surrendered the vast majority of his declared arsenal. Some call this a triumph. Others say Assad used the deal to buy time for brutal offensives in the civil war raging through the country. Western governments are investigating reports of more chemical attacks, although Russian officials said Friday that Assad's forces did not use chemical weapons. The deal was hammered out last year after a chemical attack outside Damascus killed hundreds, including children. The war had already claimed tens of thousands of civilians, yet the world was horrified by footage of children struggling to breathe, then giving up. 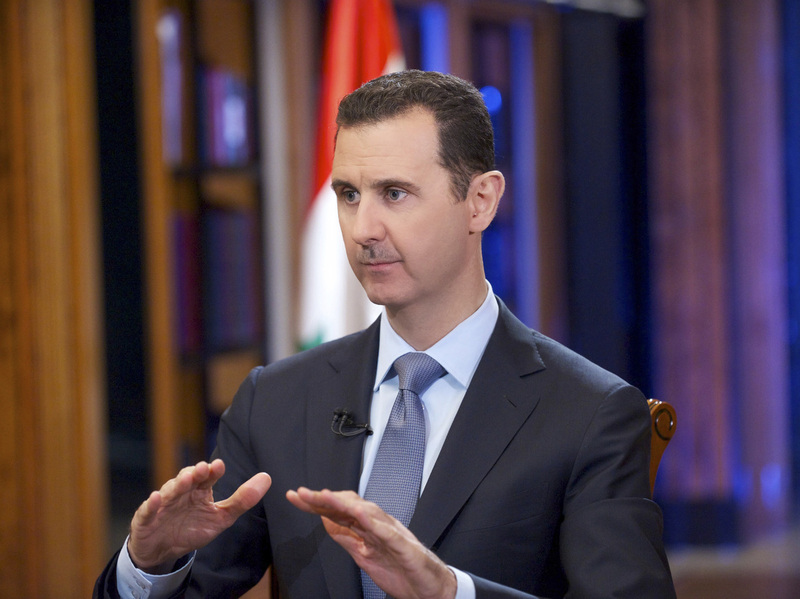 Syrian President Bashar Assad (seen here in September 2013) agreed to relinquish the regime's known chemical weapons and precursor materials after a chemical attack on Ghouta, just outside Damascus, in August 2013 killed hundreds, including children. Assad blamed the opposition for the attack, but presented no real evidence; American investigators said the president's forces did it. For a while, it even seemed the U.S. would strike, but instead they forged the chemical weapons amnesty. Under the deal, Assad agreed to give up 1,300 tons of dangerous chemicals, or precursor materials. "All of this is unprecedented on various levels — it's never been done to disarm a country of any category of weapons, much less strategic weapons, in the middle of a war, of a hot war," says Michael Luhan of the Organization for the Prohibition of Chemical Weapons, which is overseeing the handover. He says that the regime is on track to hand over the stockpile it's declared, despite delays. So far, about 90 percent of the declared materials have been taken out of the country by boat. But others point out that since the deal was struck, tens of thousands more civilians have died. 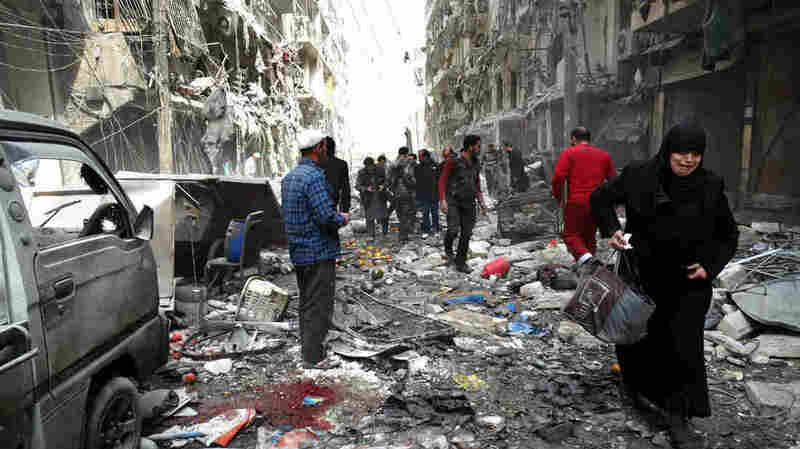 A regime assault on the city of Aleppo with crude barrel bombs has leveled whole neighborhoods. And although Western governments say Assad must go, his forces are now winning the war. "I do think it was smart of Assad, and he did in a sense rejuvenate himself to a certain degree," says Joshua Landis, of the University of Oklahoma, who is an expert on Syria. "He made a crucial deal with the United States, which made him a partner in this — and it benefited Assad tremendously." Landis says that Assad's supporters were terrified the U.S. was going to attack. When the chemical weapons deal was struck, that fear disappeared. "The United States did not bomb, Saudi Arabia was furious, the rebels felt completely downcast, and Assad could continue on, bombing with impunity in Syria," Landis says. "It was very clear, from the beginning of the civil war and talking to Syrian government people, that their one calculation at the beginning of this war was that if the U.S., if F-16s do not come over the horizon, Assad can prevail." A Syrian woman cries as she leaves a residential block in Aleppo, Syria, reportedly hit by an explosives-filled barrel dropped by a government forces helicopter on March 18. Recently, there have even been questions about whether chemical attacks have stopped. French and American officials say they are investigating allegations of small-scale chlorine gas attacks. Chlorine is used in industrial processes, and was not covered in the agreement to ship chemical weapons out of the country. Activists, doctors and political opposition members say there have been at least seven occasions in the past six weeks when gas has been used. Regime and rebels acknowledge some of the instances but blame each other. The influential blog Brown Moses provides detailed analysis of the Syrian war and is often cited by human rights groups. It reported that in an attack earlier this month, activists say gas was dropped from a helicopter — which only the Syrian government has. The government has denied the reports. And some think that the regime has not declared or given up all of Syria's supply of chemical weapons. 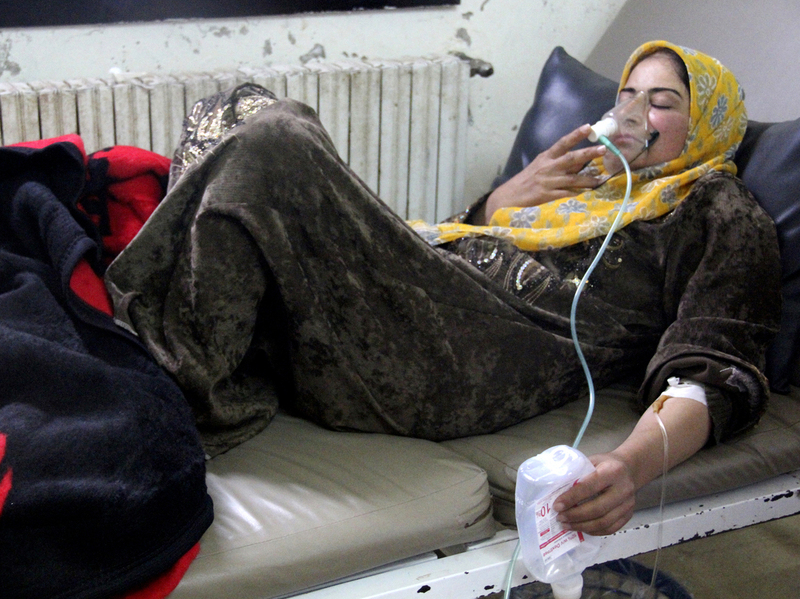 A woman, affected by what activists say was a chlorine gas attack, breathes through an oxygen mask inside a field hospital in Kfar Zeita village in the central province of Hama on April 12. Activists, doctors and political opposition members say there have been at least seven gas attacks in the past six weeks. "There are potentially about 200 tons of precursor chemical weapons, or potentially chemical weapons themselves, that are potentially missing from the declared stockpile," says Hamish de Bretton-Gordon, a chemical weapons expert who works on Syria. "So either the regime has kept some back, which is I think is very likely, and/or opposition groups have obtained some." Thus far the opposition hasn't been able to prove that the regime is behind recent attacks. And Syria's staunch ally Russia, which was instrumental in negotiating the deal, said Friday that the accusations against government forces are "fabricated." But even as vast quantities of chemicals are safely on ships heading away from Syria, the suffering in the country continues. Next week, the U.N. Security Council plans to review a report that the regime has flagrantly violated international law by not allowing aid to rebel-held areas.